Yazoo Records #4. Don’t Leave Me Here, The Blues of Texas, Arkansas & Louisiana. 1927-1932 (L-1004). 1968. Op deze in 1968 uitgebrachte LP ‘rural blues’ uit de zuidelijke staten. Het Yazoo label heeft deze LP ook uitgebracht onder de noemer “Tex-Arkana-Louisiana Country 1929-1933”. 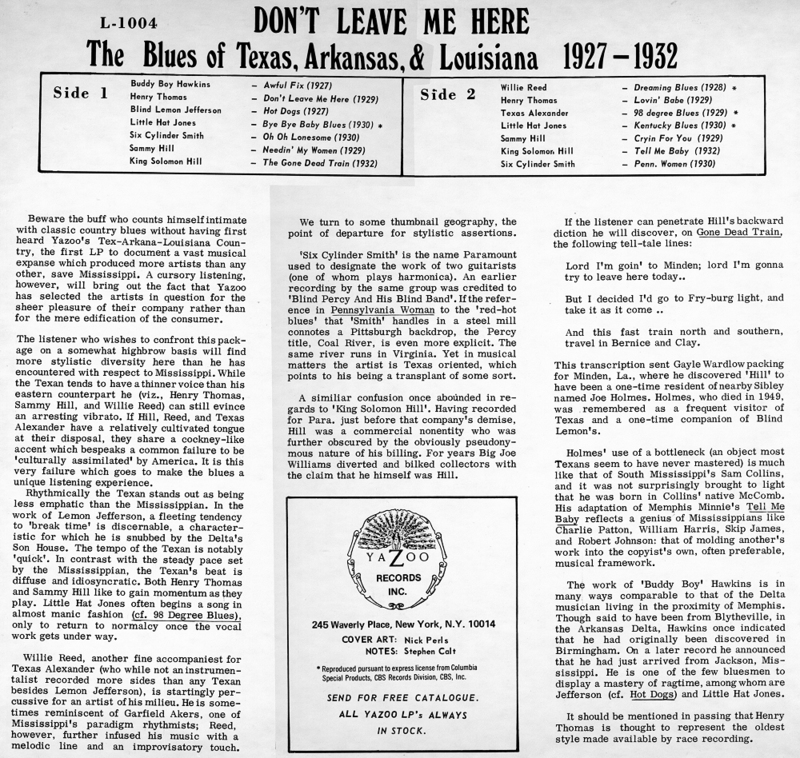 Don’t Leave Me Here, The Blues of Texas, Arkansas & Louisiana 1927-1932. (L-1004) 1968. 1. Buddy Boy Hawkins – Awful Fix. 2. Henry Thomas – Don’t Leave Me Here. 3. Blind Lemon Jefferson – Hot Dogs. 4. Little Hat Jones – Bye Eye Baby Blues. 5. Six Cylinder Smith – Oh Oh Lonesome. 6. Sammy Hill – Needin’ My Women. 7. King Solomon Hill – The Gone Dead Train. 8. Willie Reed – Dreaming Blues. 9. Henry Thomas – Lovin’ Babe. 10. Texas Alexander – 98 Degree Blues. 11. Little Hat Jones – Kentucky Blues. 12. Sammy Hill – Cryin’ For You. 13. King Solomon Hill – Tell Me Baby. 14. Six Cylinder Smith – Pennsylvania Woman Blues. Before The Blues, The Early American Black Music Scene As Captured on Classic Recordings From The 1920’s and 1930’s. Vol.1 CD (Yazoo, 2015) 1996. 15. B.F. Shelton – Pretty Polly. 16. Weaver & Beasley – Soft Steel Piston. 17. Bayless Rose – Jamestown Exhibition [Instrumental]. 18. Willie Walker – Dupree Blues. 19. Reverend J.M. Gates – Dying Mother and Her Child.